The International League released its 2018 roster of staff umpires ahead of Friday's opening day. 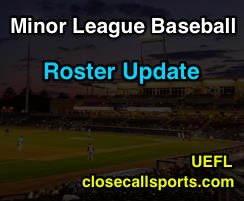 The IL is the eastern Triple-A equivalent of the west's Pacific Coast League; The 2018 PCL roster is available at this link. The 2018 International League features five Triple-A rookies, and zero transfers from the Pacific Coast League. Bold text indicates umpire is on the Major League call-up list.